Wedding gifts or wedding favours have always been a very important part in the celebration of a wedding. A wedding is incomplete without the warm, joyous presence of guests. To pull a wedding, the family members and friends of both the bride and the groom put in a lot of their time and effort. Giving them return gifts is a small, yet significant token of appreciation. In a sweet and delicate way, it is to thank them for their presence and participation in the wedding. 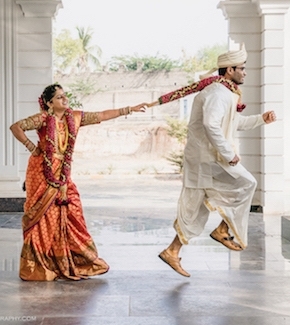 From handing over traditional dry fruit or mithayi boxes at departure, to innovative wedding favours and souvenirs, Indian wedding return gifts have come a long way. It’s always better to cook something customised up so your wedding guests remember the day. 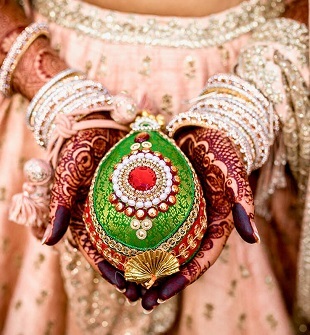 Hence, here is a list of 8 Unique Indian Wedding Favours to give your guests the most beautiful return gifts! With a twist of the traditional Indian fabric designs, umbrellas can play a part in your wedding décor. And at the end of the wedding, these are something you can give away as the wedding return gifts. 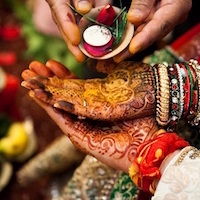 Indians and Chai have a unique, unbreakable bond, and what better way to thank your guests for attending your wedding? For a beautiful wedding favour as this, prepare a sample box that fits the budget – choose teas or coffees that are your favourites and package them well. Either one big candle, or a couple miniatures, perfumed candles is a great gift for your wedding guests. A small paper bag with a personalised message and assorted chocolates is a sweet package for the attendees. Customised designer cookies, cupcakes, doughnuts and more are among the delicious return gifts your guests will always remember. Jam or honey in jars with a beautiful little bow is a perfect gift to handover to your guests before they leave for their home. Exotic Succulent Plants in handmade pots is one of the most sensible gifts since not only are they beautiful but also low maintenance for your guests. Handmade table clocks, mirrors and more are among gorgeous souvenirs to give to your guests which are easily available and budget-friendly.